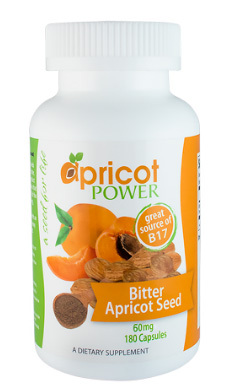 Bitter Apricot Seed - 60 mg, 180 Capsules (Apricot Power) - Penn Herb Co. Ltd. The Benefits of Apricot Seeds Without the Bitter Taste! Apricot seeds are a Top 10 Super Seed! Our apricot seeds are a completely raw and natural California-grown bitter, vegan, gluten-free, pesticide-free, and non GMO product that is not steamed or cooked in any way. This ensures that each capsule retains the full nutritional value and all of the power packed nutrients including B17 (approx. 60 mg), Pangamic Acid (B15) as well as naturally occurring enzymes. We have packed each vegetable capsule with an average of 2 1/2 ground seeds to make it extremely easy for you to get this great nutrition back in your diet. AMOUNT PER SERVING (1 CAPSULE): Apricot Seed Powder 500 mg (Amydgalin B17) approx 60 mg. OTHER INGREDIENTS: Vegetable Cellulose (capsule). While everyone's nutritional needs are different, we do not recommend consuming more than 1 capsule per hour. As a dietary supplement take 1 capsule before a meal and consume no more than 10 capsules in one day, unless otherwise instructed. DO NOT EXCEED RECOMMENDED DOSE. PREGNANT OR NURSING MOTHERS, CHILDREN, AND INDIVIDUALS WITH A KNOWN MEDICAL CONDITION SHOULD CONSULT A PHYSICIAN BEFORE USING. IF YOU HAVE ANY ADVERSE REACTIONS, DISCONTINUE IMMEDIATELY. Section 10786, Title 17, California Administration Code: Warning, apricot seeds may be toxic, very low quantities may cause reaction.